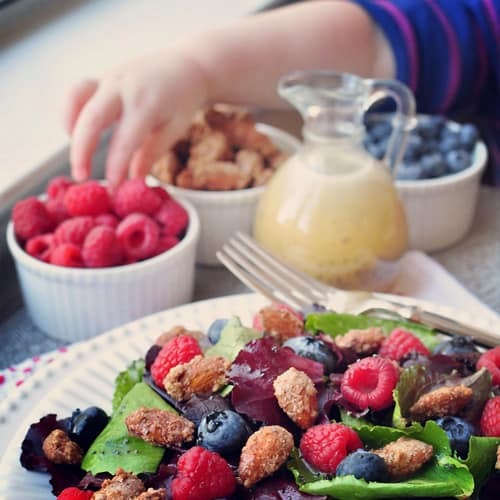 The flavors of spring mingle in this beautiful and tantalizing mixed greens salad, studded with plump blueberries, juicy raspberries, crunchy candied almonds, and a sweet, poppy seed-infused Honey Citrus Vinaigrette. Happy first day of spring, y’all! 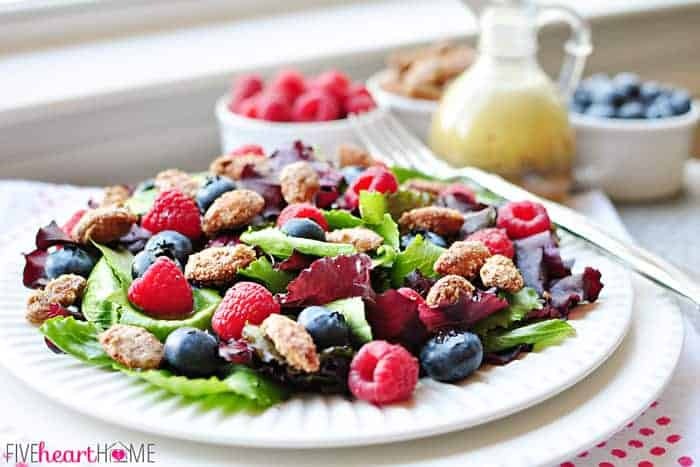 The flavors of spring mingle in this beautiful and tantalizing mixed greens salad, studded with plump blueberries, juicy raspberries, crunchy candied almonds, and a sweet, poppy seed-infused Honey Citrus Vinaigrette. In a large bowl, use an electric mixer to beat egg white and water until stiff peaks just start to form. Blend in sugar and salt. 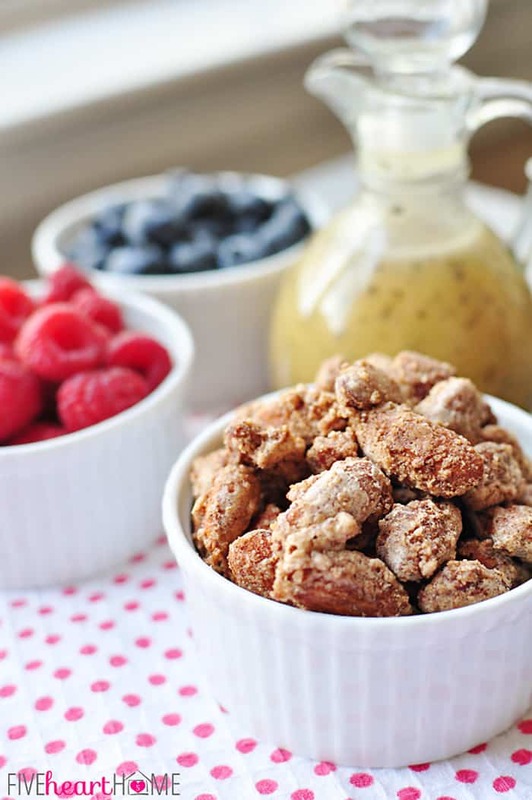 Fold in almonds and spread mixture in a single layer onto prepared pan. Bake for approximately 40 minutes total, stirring and flipping almonds every 10 to 15 minutes. Watch nuts very closely during the last 10 minutes of cooking time, removing them from oven sooner if they are getting too dark. Nuts are done when they are mostly dry and golden brown. Allow almonds to cool on pan until they are completely dry and crunchy, stirring occasionally to break them up. Store in an airtight container for two to three weeks. Add all ingredients to a jar with a tight-fitting lid. Shake vigorously until mixture is well-blended. Alternatively, you may mix in a blender, food processor, or by hand in a bowl with a whisk. Place your desired amount of mixed greens on a plate. 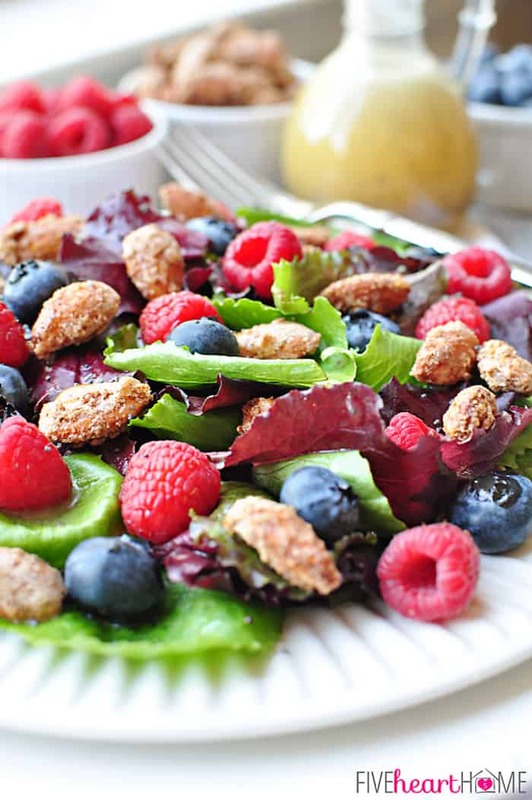 Arrange berries and candied almonds over the top. 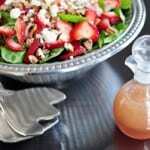 Drizzle with vinaigrette, to taste. The almond and egg white mixture will be very wet and goopy at first. Just do your best to flip the almonds and spread them back out into a single layer the first couple of times that you stir them. I find it helpful to clean my spatula between flipping them. 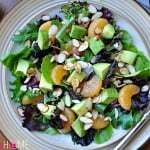 To make a large bowl of salad for approximately 8 to 10 servings, use about 10 ounces of mixed greens, a 6-ounce carton of raspberries, a 6-ounce carton of blueberries, a cup of nuts, and dressing to taste (tweak amounts as desired). Samantha, I think I just fell in love with this salad! 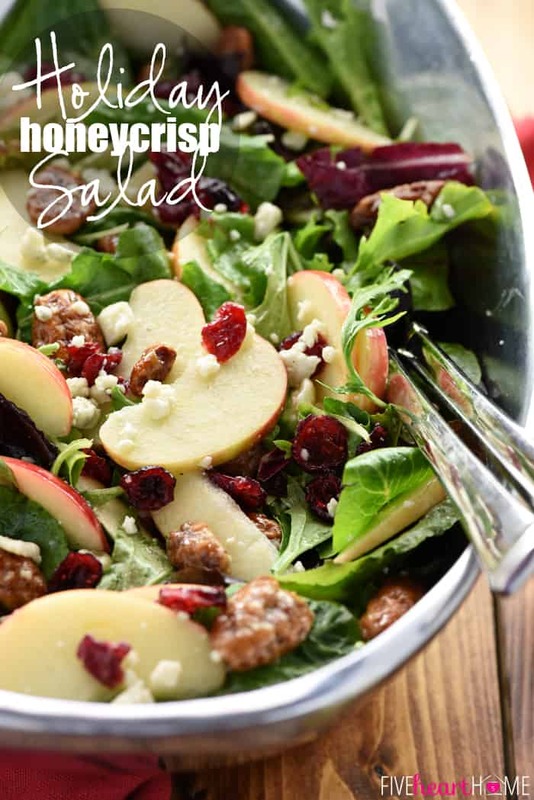 It has so many amazing flavors and I especially love those candied almonds. It looks like spring in a bowl! Thanks so much, Amy! That’s kind of what I was going for…spring in a bowl. 🙂 I’m celebrating the end of winter in every way that I can! Hope you have a great weekend…I appreciate you stopping by! Roll on Spring and all the bright beautiful tasty things that come out of a garden. 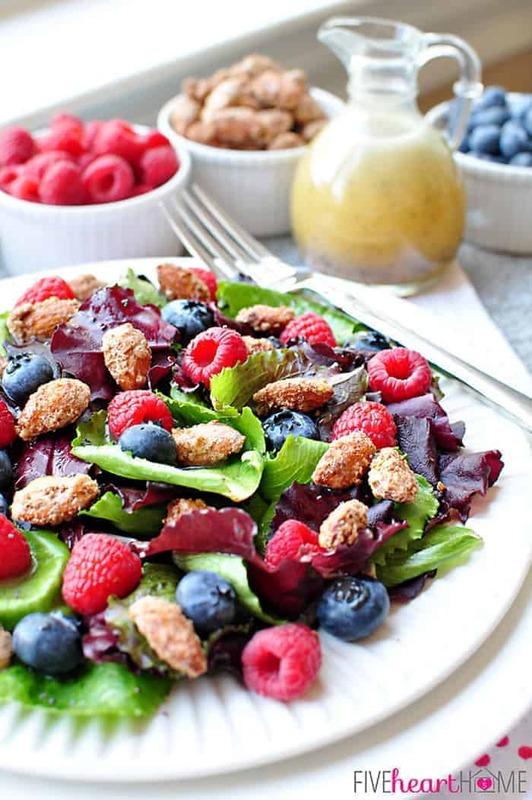 Gorgeous salad. Pinning and will be making this for a sunny Spring day out on my deck with friends. I hope that you and your friends enjoy it, Stephanie! Thanks so much for the thoughtful comment and the pin. 🙂 Happy Friday! I am in love with this salad. My winter blues disappeared! Cannot wait to visit the store and make it. Thank you for sharing it!! I will definitely pin this. 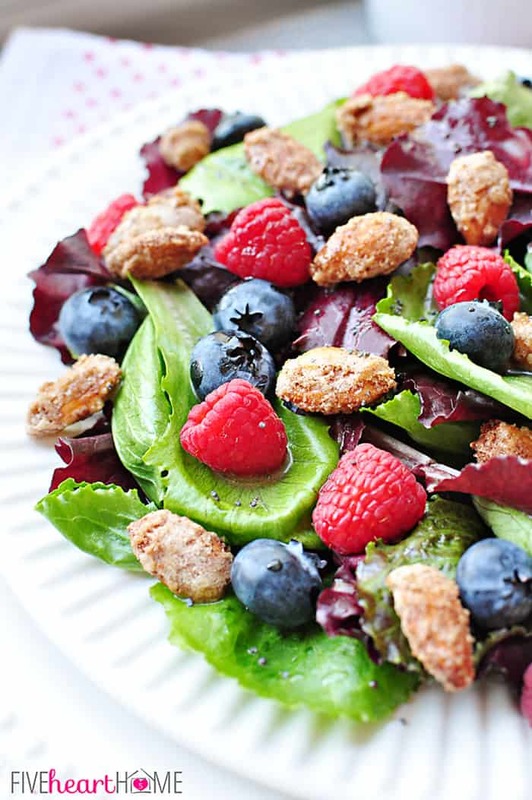 I love salads with fruit and nuts too. I am adding your vinaigrette recipe to my stash. 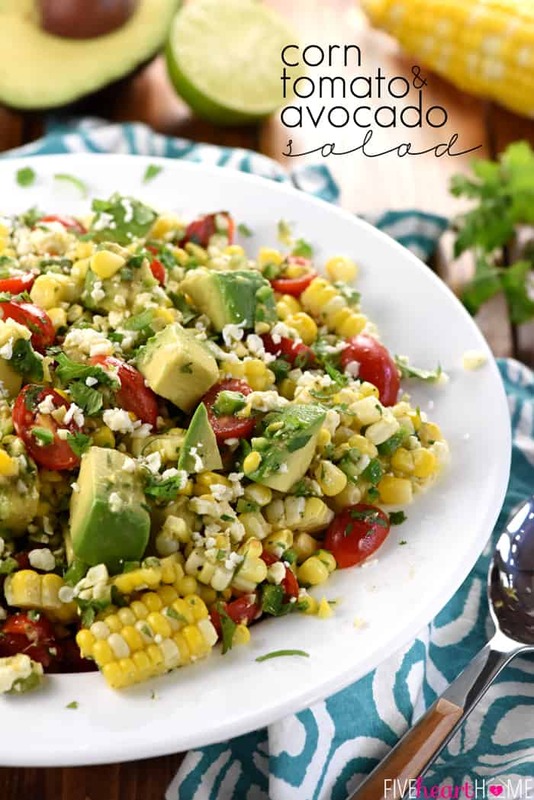 You can never have too many homemade dressing recipes 😉 This salad looks like Spring in a bowl! I think I am in love with your site. Salads, salads. everywhere, how do I choose which one to eat? 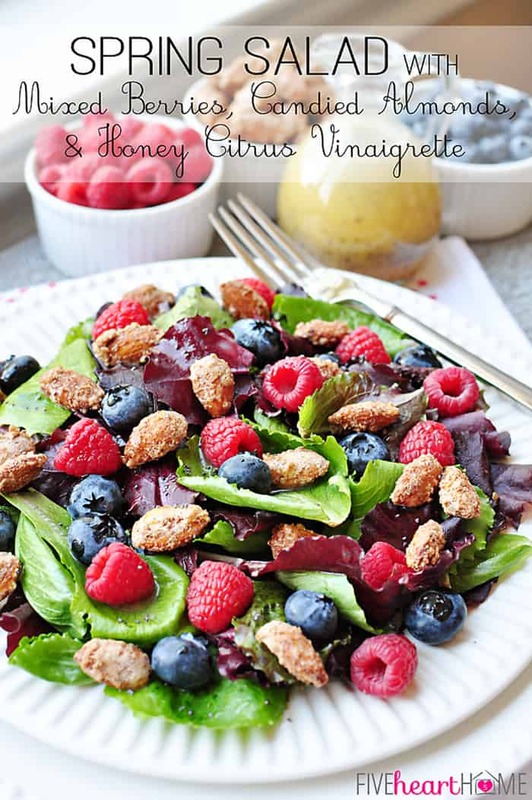 I love the fact that you get candied nuts with your healthy greens and fresh fruit. It’s the perfect combination of naughty and nice. Ha, Patti! I like that…naughty and nice. 🙂 Hope you enjoy this one if you have a chance to try it. Thanks so much for stopping by! That dressing sounds one that I used to buy from a woman at our local farmer’s market. She no longer comes and I used to love that dressing. 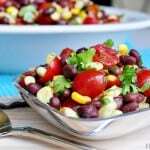 I am so glad that I found your site and that recipe, Thank you. Thank you for the sweet words, Ashlyn! 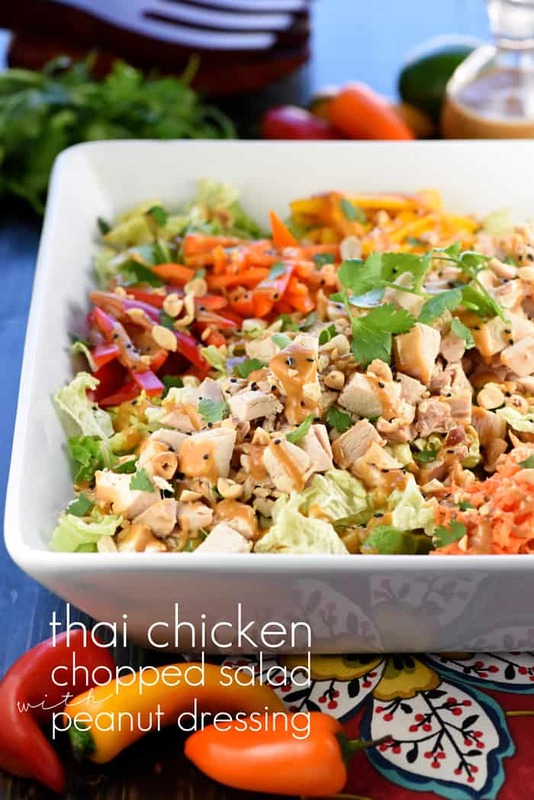 This salad is definitely a new favorite at our house for all of the reasons that you mentioned. 🙂 Thanks for taking the time to comment, and I really appreciate the pin. Have a great week! THis is a beautiful salad. I need to try this. 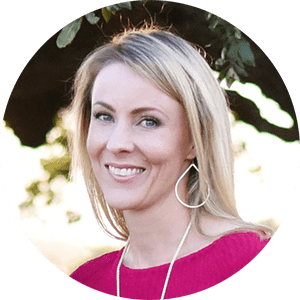 Thanks for sharing – pinned this! Gorgeous photos . . . and looks delicious! 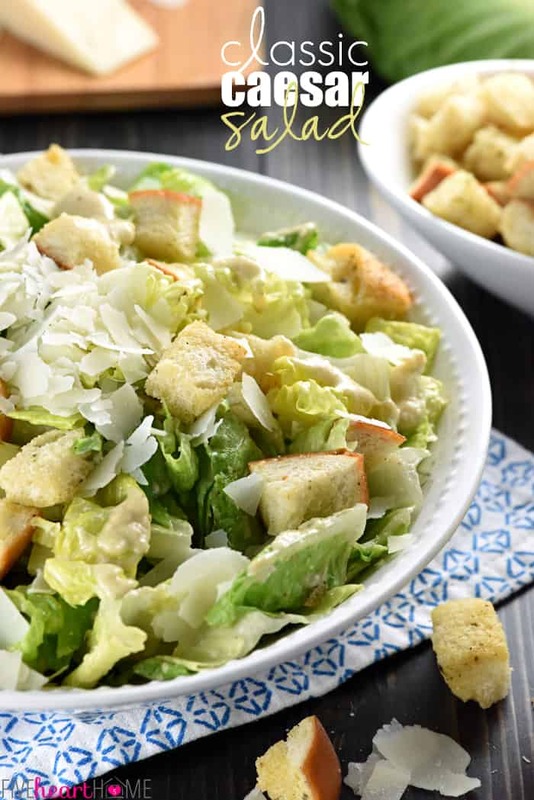 What an absolutely gorgeous and delicious salad! 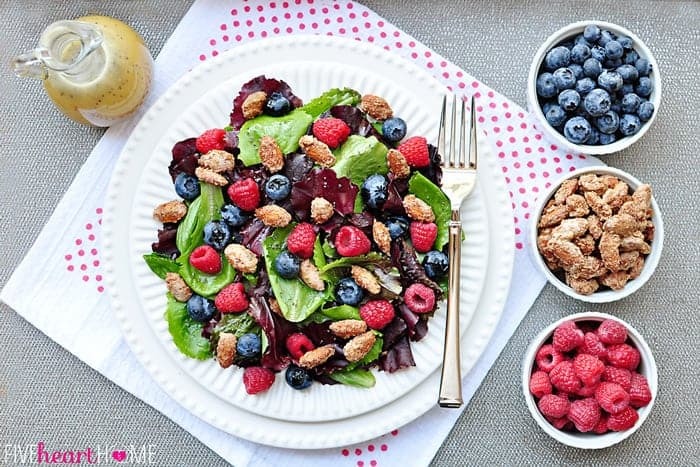 I am loving all those bright berries…and candies almonds? Yes, please! Thank you, Jocelyn! The candied almonds just might have been my favorite part. Glad I made extras… 😉 Have a great weekend! 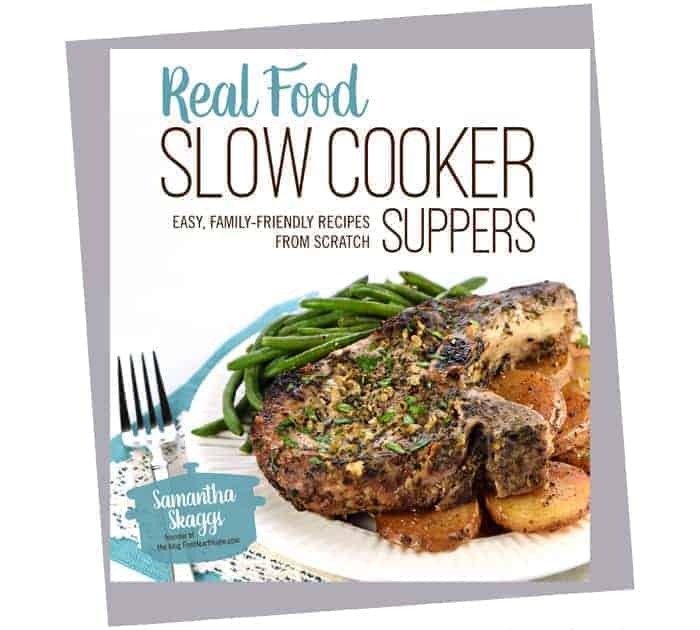 This is such a beautiful and delicious sounding salad, Samantha! 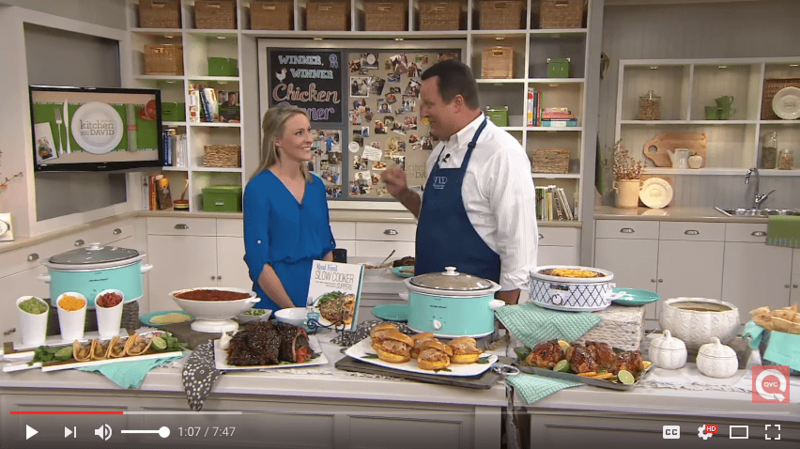 I love all the colors and fresh ingredients…one of my favorites of the week! You are too sweet, Cathy…thank you! Thanks for stopping by, and I hope you have a great week! I love red berries so much but always eat them plain, or mixed with yogurt. 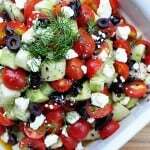 How amazing is this salad, I don’t dare to test such mixes at home but will give this mixed salad a try.